If you think you've seen it all when it comes to Grand Strand shopping, think again. 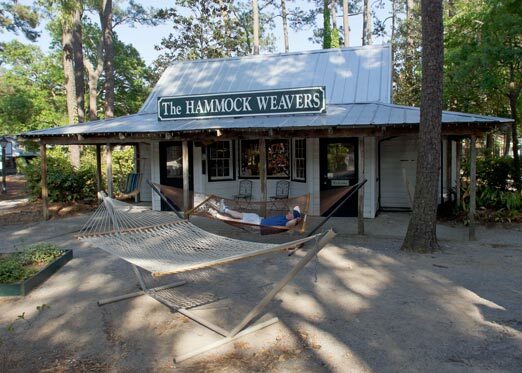 The Hammock ShopsVillage in Pawleys Island, South Carolina provides a relaxing shopping experience that is far from typicalof today's mega malls and outlet shopping excursions. If you are looking for something different, thatoffers you the latest in shopping at your own pace, The Hammock Shops Village is especially for you.Established more than seventy-five years ago in 1938 and situated along the southern Grand Strand, TheHammock Shops Village began with just one building that focused on the art of hammock-making.Founded by the family and descendants of Riverboat Captain Joshua John Ward, the Original HammockShop set the standard for local craftsmanship. Conveniently located on Highway 17, The Hammock Shops Village has grown to over twenty buildingsand businesses, each representing its own craft. Many of the buildings were saved from demolition andplaced in this area, carrying on the legacy of these traditional Southern shops. When strolling throughthe Village, you may have the exceptional opportunity to see these local artisans weaving hand-craftedhammocks or making sweetgrass baskets. The dozens of quaint shops offer everything from trendy clothing and shoes to handcrafted collectiblesand jewelry. The fun doesn't stop there, however, as The Hammock Shops Village also offers delectableand alluring dining experiences. With four exciting options to choose from, there is something foreveryone. Cera Sushi offers an elaborate menu for sushi lovers, and Pawleys Prime provides a luxuriousdinner experience with its eclectic food and beverage selections. Open each day at 5pm, Pawleys Primeis a great choice for fine dining in The Hammock Shops Village. If you're looking for something morecasual, don't miss out on BisQit and its smaller namesake BisQit Little, as these restaurants offer uptraditional favorites like hamburgers and hot dogs. No matter what you choose, all of these diningexperiences are "Deliciously Pawleys." Take a trip south of Myrtle Beach and spend some time in the beautiful and charming city of PawleysIsland. The Hammock Shops Village is a unique and time-tested spot for fun shopping and spectaculardining.